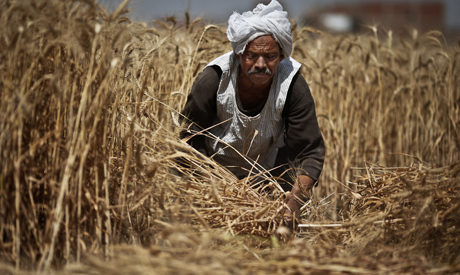 Egypt’s government is expecting more wheat than ever before from local farmers this year, thanks to the introduction of a new nationwide system of contractual farming, officials from the agriculture ministry told Ahram Online. The world’s largest wheat importer is expected to buy 4.25 million tons of local wheat by July this year, almost half of the projected harvest's 9.6 million tons. Egyptians consume a total of between 15 and 20 million tons of wheat per year, of which 10 million tons are produced locally, with the rest coming from imports. Egypt’s government has long subsidised local wheat farmers, offering them more than the global price to secure enough flour for its mammoth-sized bread subsidy program that costs LE22 billion a year. This year, the government’s wheat buyers – the Principal Bank for Development & Agricultural Credit (PBDAC) – are offering LE2,800 per ton, LE600 over the price of imported wheat, according to Supply Minister Khaled Hanafy, who oversees the subsidised bread system. Historically, though, flaws in the system have limited the quantity of local government-bought wheat to under 4 million tons, said Ashraf El-Ghannam, head of the agriculture ministry's department for agricultural extension services. Last year that number reached only 3.4 million tons. This year will be different, however, says El-Ghannam, as authorities have taken measures to boost local procurement while protecting Egypt’s wheat farmers from predatory traders and middlemen. "Traders and middlemen take advantage of the fact that farmers are often weary of the cost of transporting their harvest to the PBDAC and waiting for hours in long lines to sell their produce," explains El-Ghannam. "Farmers can lose as much as LE50 per ardeb," he says. An ardeb is a unit of measurement which the government sets at 150kg, but which traders can set at 155kg. Moreover, says El-Ghannam, traders buy the ardeb of wheat at a price 14 percent lower than what the government offers them for it. To help farmers bypass middlemen this year, the government has empowered 6,500 farmers’ cooperatives nationwide to buy their wheat directly, alongside the PBDAC. Through the cooperatives, the government has signed 186,000 contracts with farmers working on 893,000 feddans of wheat (about 927,000 acres), according to recent statements by Ayman Abu-Hadid, minister of agriculture and land reclamation. In return for fertilisers, seeds and technical assistance, the farmers deliver their produce to the cooperatives, who collect it on behalf of the state. Farmers not contracted under the new programme will also be able to sell their wheat to the government. The PBDAC will also open its branches exclusively for farmers and cooperatives five days a week, reserving just two days for "other customers," a measure intended to hinder traders, said El-Ghannam. The harvest season has also officially been extended for the first time this year, said El-Ghannam, starting two weeks earlier so as to allow farmers to deliver their wheat to the government from mid-April to mid-June. The surface area planted with wheat this year amounts to 3.5 million feddans, according to El-Ghannam, a 100,000 feddan increase on last year. Productivity is also expected to increase to 2.8 tons per feddan – up from 2.7 tons last year, says the official.